275 Marlborough is located on the north side of Marlborough, between Exeter and Fairfield, with 261 Marlborough to the east and 277 Marlborough to the west. 275 Marlborough was designed by architect Carl Fehmer and built in 1886 by James Smith, builder, as the home of George Hayward Binney and his wife, Edith Barrett (Marsh) Binney. He is shown as the owner on the original building permit application, dated March 17, 1886, and on the final building inspection report, dated November 13, 1886. George Binney purchased the land for 275 Marlborough on March 3, 1885, from Nelson Slater Bartlett, who had purchased it from the Commonwealth of Massachusetts on February 26, 1886. Click here for an index to the deeds for 275 Marlborough. George Binney was an insurance broker and Edith Marsh was the daughter of Charles Marsh, partner in the dry goods firm of Jordan, Marsh & Co. They had married in October of 1884, after which they had lived at the Hotel Guilford at 220 Clarendon and then at 282 Marlborough. They continued to live at 275 Marlborough in 1889. According to the Times article, in London he engaged in the tobacco insurance business and, in 1892, was arrested for “kiting checks” under the name of William M. Binney. 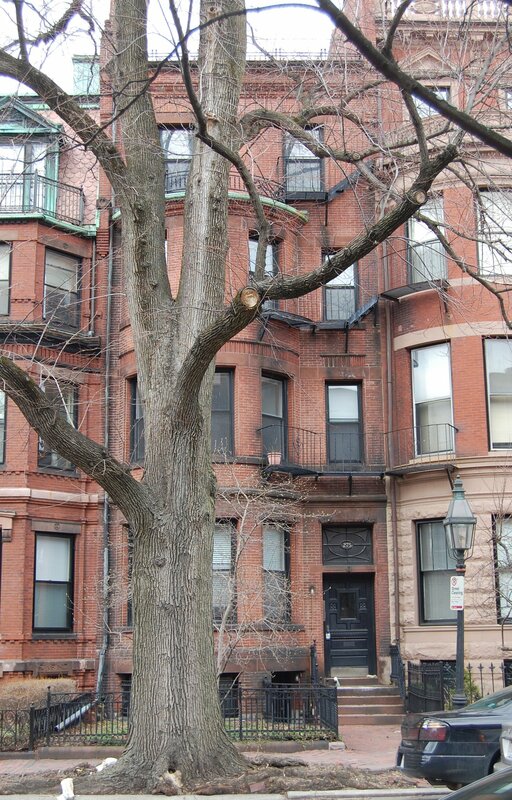 After he fled Boston, Edith (Marsh) Binney moved to live with her widowed mother, Julia (Barrett) Marsh, at 35 Commonwealth, listing herself as the “widow of George H. Binney” in the 1890 City Directory. 275 Marlborough was not listed in the 1890 Blue Book. On December 9, 1889, Charles A. Vialle foreclosed on a mortgage he held originally given by George Binney to George Wigglesworth, and sold 275 Marlborough to Elizabeth M. (Lawrence) Barr Barrett, the wife of George Robert Barrett. They previously had lived at 14 Arlington. George Barrett was the first cousin of Edith (Marsh) Binney’s mother, Julia (Barrett) Marsh (Julia Barrett’s father, Charles, was the brother of George Barrett’s father, George). Living with the Barretts were Elizabeth Barrett’s unmarried children by her first marriage, to George Lyman Barr, who died in April of 1877: Laura Maria Barr, Caroline Hartwell Barr, and Daniel Lawrence Barr. Caroline Barr married in April of 1897 to Winthrop Howland Wade, an attorney, and moved to Dedham. The Barretts, Laura Barr, and Lawrence Barr, continued to live at 275 Marlborough in 1907. 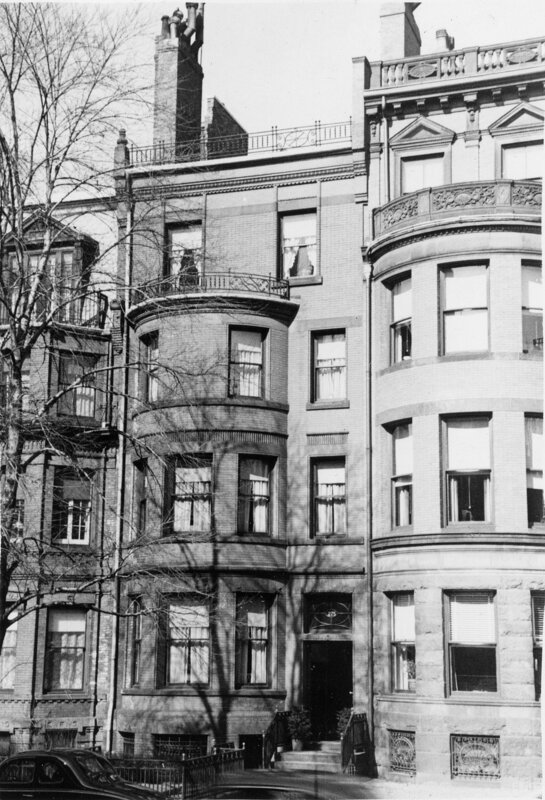 By the 1907-1908 winter season, they were living at the Lenox Hotel at 61 Exeter. On June 24, 1907, 275 Marlborough was purchased from Elizabeth Barrett by Miss Maud Elizabeth Appleton. She lived there with her parents, Samuel Appleton and Julia (Kimball) Appleton. They previously had lived at 44 Gloucester. Samuel Appleton was an insurance broker, credited with introducing employers’ liability insurance in the United States and called the “dean of casualty insurance underwriters in America” in his August 26, 1926, Boston Globe obituary. Julia Appleton died in May of 1911. Samuel Appleton and Maud Appleton, continued to live at 275 Marlborough, joined by 1914 by Miss Charlotte Peirce. They also maintained a home, Broadmere, at Peaches Point in Marblehead. Samuel Appleton died in August of 1926. Maud Appleton and Charlotte Peirce continued to live at 275 Marlborough during the 1926-1927 winter season, but moved thereafter. On June 4, 1927, 275 Marlborough was purchased from Maud Appleton by Clara Ethel (Purdon) Dupee, the wife of William Arthur Dupee. They previously had lived at 7 Fairfield. They also maintained a home in Biddeford, Maine. William Dupee was a wool merchant and later served as treasurer of the Provident Institution for Savings. He died in April of 1949. 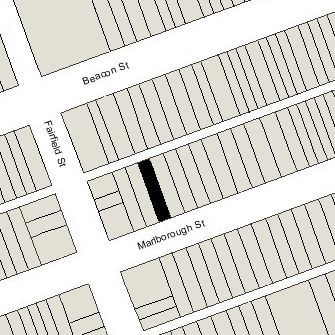 Ethel Dupee continued to live at 275 Marlborough until about 1952, when she moved to an apartment at 276 Marlborough. She died in November of 1953. On November 30, 1951, 275 Marlborough was purchased from the Merchants National Bank of Boston, conservator of the property of Ethel Dupee, by Benjamin Dunham Gilbert and his wife, Ethel Stella (Campbell) Gilbert. They previously had lived at 348 Commonwealth He was president of Gilbert Associates, Inc., collectors and adjustors. On February 12, 1952, the Gilberts transferred 275 Marlborough to their son-in-law and daughter, George H. Raynard, a sporting goods dealer, and Beatrice Louella (Gilbert) Raynard. They Raynards transferred the property back to the Gilberts on September 9, 1952. The Gilberts continued to live at 275 Marlborough until about 1953, when they moved to Milton. On May 8, 1953, 275 Marlborough was purchased from the Gilberts by Louis Ferrari and his wife, Mary Madeline (Moriarty) Ferrari. They previously had lived in an apartment at 338 Beacon. He was treasurer of the Moose Head Tavern at 473 Stuart. They continued to live at 275 Marlborough in 1955, but had moved to Jamaica Plain by 1956. On October 25, 1955, 275 Marlborough was purchased from the Ferraris by real estate dealers Stuart H. Hastings and Joseph A. Gautreau. On February 17, 1956, 275 Marlborough was purchased from Stuart Hastings and Joseph Gautreau by Alvin L. Lipsky (two-thirds interest) and Mark Gordon (one-third interest). In February of 1956, Alvin Lipsky applied for (and subsequently received) permission to convert the property from a single-family dwelling into eleven apartments. The property changed hands and on December 1, 1969, was acquired by Ralph E, Torchio, trustee of the Underwood Realty Trust. He and his wife, Frances E. (Scalese) Torchio lived in Belmont. Ralph Torchio died in November of 1989 and Frances Torchio died in June of 2011. On the same day, 275 Marlborough was acquired from the Torchio family by the 275 LLC (Matthew Piccione, manager of record). On November 20, 2013, 275 Marlborough was acquired from the 275 LLC by 275 Hexagon LLC (Sandra Edgerley, manager of record). On January 14, 2014, it filed for (and subsequently received) permission to remodel the property and reduce the occupancy from eleven apartments to seven apartments.